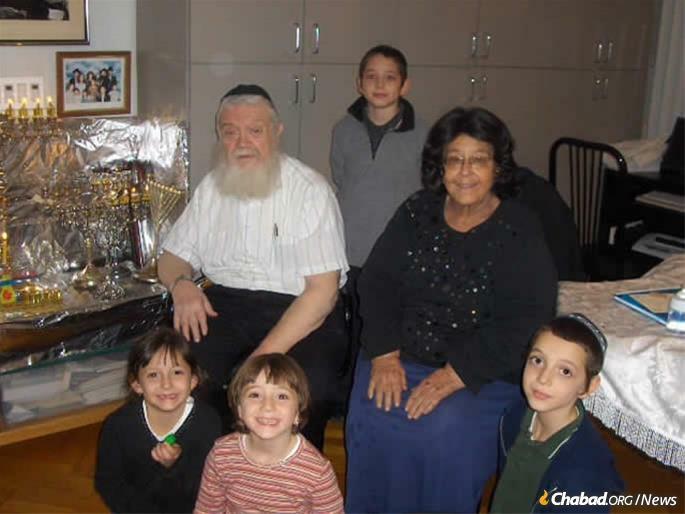 He had no official title and received no salary, but with dedication and love, Rabbi Mendel Baumgarten, who passed away this week at the age of 92, was a lifelong Chabad-Lubavitch emissary dedicated to teaching Torah and sharing the joys of Judaism with anyone he met. Mendel Baumgarten’s fruitful life began on the Jewish New Year for Trees, 15 Shevat, 1927. His father, Zeev (William), was an American-born chiropractor who was fully committed to Jewish life and Torah. His mother, Mirel, was born in Galicia, Poland. Both came from Chassidic stock, and they raised their children—Berel, Yachet and Mendel—in a home infused with faith and dedication to Torah ideals. 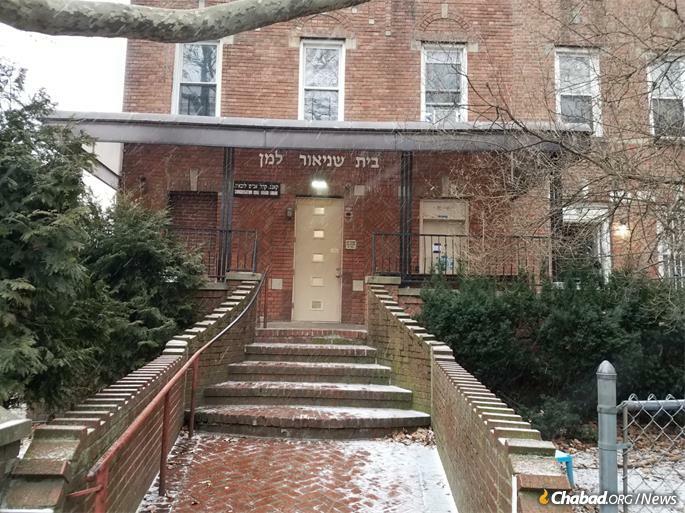 Young Mendel received his early Torah education at Yeshiva Rabbi Chaim Berlin, which was then located around the corner from the Baumgarten home in the Brownsville neighborhood of Brooklyn, N.Y. Through his brother Berel, Mendel was introduced to the world of Lubavitch, which had taken root in the nearby Crown Heights neighborhood. 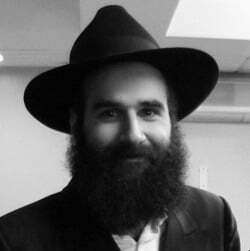 As a high-schooler, he transferred to the Chabad yeshivah at 770 Eastern Parkway, where he became a devoted follower of the Sixth Lubavitcher Rebbe, Rabbi Yosef Yitzchak Schneerson of righteous memory. In 1948, together with fellow student Zalman I. Posner, Baumgarten was dispatched by the Rebbe to Europe to serve the needs of Holocaust survivors and refugees from Stalinist oppression living in displaced persons camps in France, Italy, Austria and Holland. 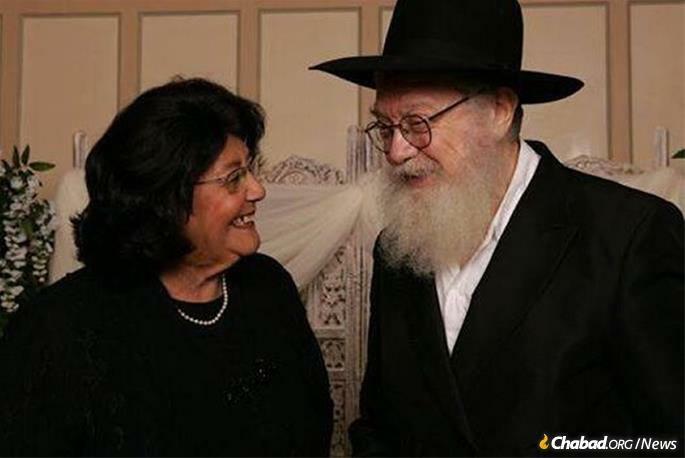 In 1949, he married Sarah Nechama Groner, and the couple looked forward to becoming shluchim, Chabad emissaries, like their peers and siblings (Rabbi Berel Baumgarten was the pioneering Chabad emissary to Buenos Aires, Argentina; and Sarah Nechama’s brother, Rabbi Y.D. Groner led Australian Jews for more than 50 years). Yet the Rebbe—Rabbi Menachem M. Schneerson, of righteous memory—insisted that their place was Crown Heights. When the Baumgartens wrote a letter to the Rebbe expressing their willingness to move anywhere in the world they were needed, the Rebbe replied that they were “drafted” to be Chabad emissaries in Crown Heights, acting within Lubavitch Youth Organization and Lubavitch Women’s Organization, which he had recently founded. Baumgarten supported his family by serving as a shochet (kosher slaughterer) in abattoirs in the New York area, but his focus was on outreach work, ready to do whatever was necessary. 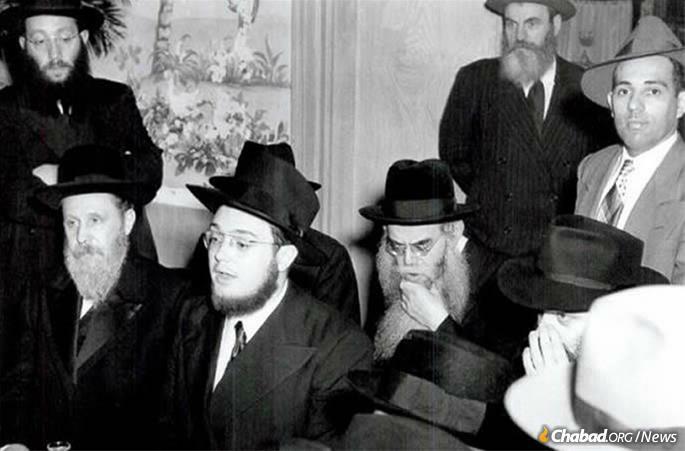 The Lubavitcher Rebbe, seated at right, and the Rebbe's brother-in-law, Rabbi Shemaryahu Gurary, seated at left, flank Rabbi Mendel Baumgarten at his wedding. Many weeks the Baumgartens would leave their children and travel to lead Shabbatons for students and youth. One time, arriving back in Brooklyn late at night, the Baumgartens stopped by 770. At the suggestion of her brother, Rabbi Leibel Groner, a member of the Rebbe’s secretariat, they stood near where the Rebbe would walk by. Upon seeing the couple, the Rebbe greeted them with a broad smile. They were later told by the Rebbe’s staff that it had been the first time they had seen the Rebbe smile in a week. Dubbed Avraham Avinu’s Shtub, the “home of the Patriarch Abraham,” the Baumgarten household (first on Eastern Parkway and then on Carroll Street) saw a steady stream of guests. Over the course of their near seven decades of marriage (Sarah Nechama Baumgarten passed away in 2016), the Baumgartens hosted many tens of thousands of people in their home. Identifying a need among young women wishing to rediscover their Jewish roots, Mendel Baumgarten began teaching them Torah in his home. In time, this became Machon Chana, the legendary Chabad women’s yeshivah administered by the National Committee for the Furtherance of Jewish Education. Beyond teaching and feeding, the Baumgartens cared for their flock in other ways as well. Mrs. Baumgarten became a matchmaker and guided many couples in establishing Jewish homes of their own. Next door to the Baumgarten home, this synagogue is forever associated with them and their dedication. Over the following decades, he would serve both as baal koreh (Torah reader) and teacher, giving classes in the Rebbe’s Likkutei Sichot every Friday between afternoon and Shabbat prayers, lovingly translating the original Yiddish into a masterful English, conveying the Rebbe’s wisdom to a generation of young people returning to the traditions of their ancestors. He is survived by children Rabbi Yossi Baumgarten (Johannesburg, South Africa); Shterna Rodal (Brooklyn, N.Y.); Breina Popack (Tzfat, Israel); Rabbi Leibel Baumgarten (Long Island, N.Y.); Rabbi Sholom Ber Baumgarten (Brooklyn, N.Y.); Rabbi Zalman Baumgarten (Brooklyn, N.Y.); Chanie Posner (Plantation, Fla.); Cirel Suede (Mexico City); and Rabbi Levi Baumgarten (Brooklyn, N.Y.); in addition to many grandchildren and great-grandchildren. The first visit of many over the following many years. 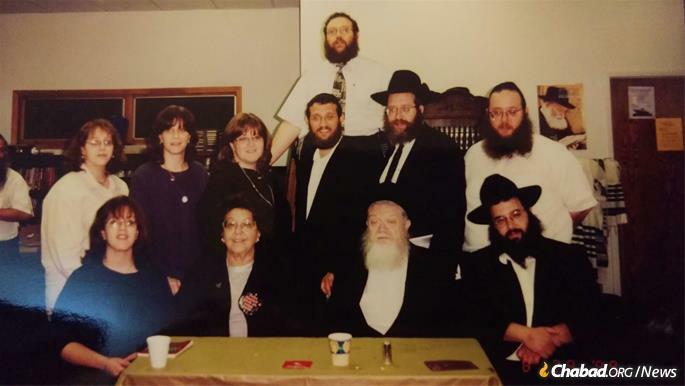 Even as a young teenager I was aware how utterly selfless and kind Rabbi and Mrs Baumgarten were: Offering unhurried individual attention no matter how busy life around them was. - Many thank you's to you Baumgarten children for sharing your parents and your home with so many who gained and learnt and subsequently sought to apply what they experienced into their own homes.